If you are a senior are you taking advantage of all the discounts available? View some of the local offers here. 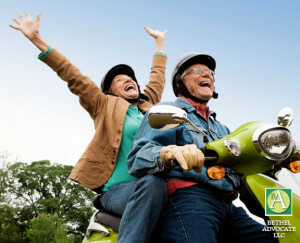 If you are a senior are you taking advantage of all the discounts available via AARP? View some of the local offers below and see more at links on bottom of page. AARP members and their guests will receive a 20 percent discount on selected performances at The Klein Memorial Auditorium in Bridgeport, CT. The performances include: Eleanor Roosevelt: Her Secret Journey, Sunday May 1, 2016 at 5:30 p.m.; Footsteps of Peace, Saturday October 22, 2016 at 8 p.m. (ticket prices and ticketing for this program are not yet available; please check back). ; and Capitol Steps, Saturday Nov. 5, 2016 at 8 p.m. (ticket prices and ticketing for this program are not yet available; please check back). To obtain the discount, AARP members may order tickets online and use promo code MEMBER20, over the the phone at (800) 424-0160 x2, or in person Monday-Friday from 11 a.m. to 3 p.m. AARP members will need to present their membership cards when picking up tickets. AARP members who enroll in an Associate’s, Bachelor’s or eligible Master’s degree program offered through Albertus Magnus College Division of Professional and Graduate Studies will receive a 10 percent tuition discount. AARP members must submit a formal application and complete requirements for acceptance into a chosen degree program. PLEASE NOTE: To receive the discount, AARP members must document their membership status by obtaining and submitting a letter from the AARP Connecticut office in Hartford, CT with their application. To obtain a membership verification letter, please contact AARP Connecticut via email at ctaarp@aarp.org or call 860-548-3164. Tuition costs vary by degree/program. For additional information about degree programs, tuition costs and available financial aid, please visit www.albertus.edu. AARP members and their guests will receive $10 off any full-priced ticket to any performance in the first three (3) weeks of a production’s run, based on availability. Discount does not apply to prior sales and cannot be combined with other offers. Reservations can be made by calling 860-527-7838 or in-person at the box office, located at 233 Pearl Street, 2nd Floor, Hartford, CT. When making your reservation, please indicate you are an AARP member and be prepared to show your AARP membership card when you arrive at the theater. AARP members may purchase one general admission at the regular price and receive one at equal or lessor value. Offer excludes events designated as “special events”. Tickets may be purchased at the ticket counter in the Museum lobby. Show your AARP card or mention this offer at time of purchase. AARP members can receive $10 off the price of an Individual or Family membership. Discount restricted to new CFPA memberships only. Purchase online at www.ctwoodlands.org/AARP and use discount code RP1516. AARP members will receive a 20 percent discount on all program fees including membership to the facility, fitness classes, sports leagues, and health and wellness workshops/seminars. AARP members will be required to show their AARP card in order to receive the discount. AARP Members can purchase up to four (4) discounted tickets to the Zoo per visit at 15 percent off the regular ticket price. Tickets can be purchased at the ticket booth located at the entrance to the park. AARP Members must present their AARP membership cards at the time of purchase. AARP members will receive 20 percent off full price tickets for matinee and evening performances on Wednesdays and matinee performances only, on Saturdays and Sundays for all 2016 productions. Members can purchase by phone at 860.527.5151, in person at 50 Church Street, Hartford (check website for hours), or online at www.hartfordstage.org using promo code AARP20. Offer not valid on Super Savers. Limit 4 tickets per guest. AARP Members and their guests will receive a discount of $5 off adult, $4 off senior and $3 off child or youth general admission. AARP members can also save $10 off a new membership with their AARP card through December 31, 2016. This admission discount is good for up to 4 admissions per visit. Discount cannot be combined with any other offer. AARP membership card must be presented at time of purchase. AARP members can purchase tickets for any show produced by the Downtown Cabaret Theater at 20 percent off the regular ticket price, subject to availability, during the period January 1, 2016 to January 31, 2017. AARP Members may purchase tickets in person at the Box Office, online at www.dtcab.com or by calling 203-576-1636 and using discount code 06106. Additional fees may apply. This discount cannot be combined with other offers. Not valid for NYE performance. Visit www.dtcab.org for complete show listings. AARP members will receive a 20 percent discount on tickets for all Harman Orchestra Classics Concerts presented during the 2016-2017 seasons. Discount applies to all ticket levels. AARP members can purchase up to four (4) tickets for each performance at the discounted rate. AARP members who purchase a season subscription can purchase a second season subscription at 50 percent off the regular price. This discount applies to new subscribers only. Tickets must be purchased by calling the Stamford Symphony Patron Services at 203-325-1407 x10 and request the AARP discount. AARP Members and their guests will receive a 20 percent discount on tickets to Garde Presented Performances* when they use the discount code “AARP1516”. *Excludes, Garde Cinema, Summer On Stage, Schooltime Performance Series and Guest Presented Performances. Discount is not available for use on previously purchased tickets or in combination with other discounts or offers. The 20 percent off code can be entered online at the bottom of the checkout page, just above where the credit card information is entered. The same code can be used over the phone and/or in person at the box office. Additional phone handling fees, internet convenience fees and an internet transaction fee may apply. Some restrictions may apply. AARP Members and up to four (4) guests will receive $1.00 off the regular price of a Child, Student/Senior Citizen, or Adult admission during the discount term. Discounted tickets can be purchased at the ticket booth located in the Museum lobby. AARP Members must present their AARP Membership card at the time of purchase. Guests must be accompanied by an AARP Member at the time of purchase. AARP Members and 1 guest will receive $2 off regular admission prices to the Museum during the offer period. Not valid on Family Festival Days. AARP Membership card must be presented at time of purchase. Click here to view offers by category on Apparel, Auto Loans, Automotive, Business Insurance, Car Rentals, Concerts, Shows & Sports, Credit Cards, Cruises, Dental Insurance, Dining, Electronics, Flights & Vacation Packages, Flowers & Gifts, Groceries, Health & Wellness, Hearing Care Program, Home, Hotels & Resorts, Identity Theft Protection, Investment Services, Life Insurance, Lifetime Income Annuities, Medicare, Movies & Music, National Parks & Activities, Property Insurance, Rail & Tours, Saving For College, Vehicle Insurance, and Vision Benefits. Click here to view national offers for discounts. I used to be very happy to search out this net-site.I wanted to thanks for your time for this glorious learn!! I positively enjoying each little little bit of it and I have you bookmarked to take a look at new stuff you weblog post. Good post. I be taught one thing more challenging on completely different blogs everyday. It’s going to at all times be stimulating to read content material from other writers and observe slightly something from their store. I抎 want to make use of some with the content on my blog whether or not you don抰 mind. Natually I抣l give you a link in your internet blog. Thanks for sharing. Needed to write you this very small word just to give thanks the moment again for your personal beautiful tactics you’ve shared above. It’s so shockingly open-handed with people like you to allow unreservedly just what a lot of folks would have made available for an e book to make some dough for themselves, most notably given that you could have tried it if you wanted. These ideas also served like a good way to understand that the rest have a similar interest just as mine to realize good deal more in regard to this issue. Certainly there are several more pleasant opportunities ahead for individuals that see your blog post. Good post. I be taught something more challenging on totally different blogs everyday. It’s going to at all times be stimulating to read content from other writers and follow a little bit one thing from their store. I抎 choose to make use of some with the content material on my blog whether you don抰 mind. Natually I抣l offer you a hyperlink in your web blog. Thanks for sharing. I intended to create you that very small remark to give thanks the moment again with the superb knowledge you’ve contributed on this website. It is quite surprisingly open-handed with you to give unreservedly precisely what a number of people would have offered as an e-book in making some profit on their own, especially considering that you could possibly have tried it in case you desired. The guidelines as well worked to become great way to be certain that other people online have the same dreams the same as my own to understand very much more concerning this problem. I’m sure there are lots of more fun instances ahead for individuals who browse through your blog. I as well as my friends appeared to be viewing the nice ideas located on the website then then came up with a horrible feeling I had not expressed respect to the web blog owner for those tips. Those ladies were consequently stimulated to learn all of them and already have in fact been taking pleasure in those things. We appreciate you genuinely very kind and also for figuring out this form of remarkable topics millions of individuals are really wanting to be aware of. Our own honest apologies for not expressing gratitude to you sooner. I discovered your blog site on google and test a couple of of your early posts. Continue to maintain up the very good operate. I simply additional up your RSS feed to my MSN News Reader. Searching for ahead to reading more from you later on!? a similar topic, your web site came up, it seems good. Google, and found that it’s truly informative. I am gonna be careful for brussels. The following time I learn a blog, I hope that it doesnt disappoint me as much as this one. I mean, I do know it was my option to learn, but I truly thought youd have one thing attention-grabbing to say. All I hear is a bunch of whining about one thing that you could possibly fix should you werent too busy in search of attention. amazing and genuinely fine data for readers. Aw, this was a very nice post. In idea I would like to put in writing like this moreover ?taking time and precise effort to make an excellent article?however what can I say?I procrastinate alot and under no circumstances seem to get something done. be updated daily. It consists of pleasant information. What’s up to every body, it’s my first pay a quick visit of this website; this webpage includes remarkable and genuinely good data for visitors. Nice post. I learn something more difficult on completely different blogs everyday. It should all the time be stimulating to read content material from different writers and practice a bit one thing from their store. I抎 want to make use of some with the content on my weblog whether you don抰 mind. Natually I抣l give you a link on your net blog. Thanks for sharing. Thanks so much for giving everyone an extraordinarily brilliant possiblity to check tips from here. It is usually very sweet and also full of a great time for me personally and my office acquaintances to search your blog at least three times in 7 days to study the fresh issues you will have. And of course, I’m so certainly fascinated concerning the astounding information you give. Some 2 points in this post are certainly the most efficient I’ve had. I抦 impressed, I need to say. Really not often do I encounter a weblog that抯 both educative and entertaining, and let me inform you, you’ve got hit the nail on the head. Your concept is outstanding; the issue is something that not enough persons are speaking intelligently about. I am very glad that I stumbled across this in my seek for one thing regarding this. Hi, every time i used to check web site posts here in the early hours in the morning, since i love to find out more and more. Youre so cool! I dont suppose Ive read something like this before. So good to search out someone with some unique thoughts on this subject. realy thank you for beginning this up. this website is something that’s needed on the web, someone with a bit of originality. useful job for bringing one thing new to the web! to create my very own blog and want to find out where you got this from or exactly what the theme is called. be a leisure account it. Glance advanced to more brought agreeable from you! Good post. I be taught something more difficult on different blogs everyday. It’s going to at all times be stimulating to read content from different writers and apply a little something from their store. I抎 favor to use some with the content on my blog whether or not you don抰 mind. Natually I抣l give you a hyperlink in your net blog. Thanks for sharing. When I originally commented I clicked the -Notify me when new feedback are added- checkbox and now each time a comment is added I get four emails with the identical comment. Is there any approach you can remove me from that service? Thanks! May I simply just say what a relief to discover somebody that truly knows what they are talking about on the net. Can I just say what a aid to search out someone who really is aware of what theyre speaking about on the internet. You definitely know methods to bring an issue to gentle and make it important. More people must read this and perceive this facet of the story. I cant believe youre no more in style since you undoubtedly have the gift. Needed to create you the little word just to say thanks again on your magnificent knowledge you’ve discussed at this time. This is really seriously open-handed with people like you in giving openly exactly what a few individuals could have distributed for an e-book to generate some dough for their own end, specifically since you might have done it if you considered necessary. The guidelines likewise served as a good way to comprehend some people have the identical keenness just as mine to figure out more and more when it comes to this condition. I’m sure there are lots of more pleasant times up front for individuals that go through your website. After I originally commented I clicked the -Notify me when new comments are added- checkbox and now each time a comment is added I get four emails with the same comment. Is there any means you can take away me from that service? Thanks! A powerful share, I just given this onto a colleague who was doing just a little analysis on this. And he in truth bought me breakfast because I found it for him.. smile. So let me reword that: Thnx for the deal with! But yeah Thnkx for spending the time to discuss this, I really feel strongly about it and love studying extra on this topic. If potential, as you turn into experience, would you thoughts updating your blog with extra details? It is highly useful for me. Huge thumb up for this blog publish! Howdy! I simply wish to give a huge thumbs up for the good data you’ve gotten here on this post. I shall be coming again to your blog for extra soon. Thanks a lot for giving everyone an extraordinarily brilliant possiblity to read in detail from this web site. It really is so brilliant and packed with a lot of fun for me and my office acquaintances to visit your blog the equivalent of three times every week to see the newest guidance you have got. And definitely, we are always happy considering the fabulous secrets served by you. Some two areas on this page are without a doubt the finest we have had. Can I just say what a reduction to search out somebody who actually knows what theyre talking about on the internet. You undoubtedly know learn how to bring a difficulty to gentle and make it important. Extra people need to read this and perceive this facet of the story. I cant believe youre no more well-liked since you definitely have the gift. Good way of explaining, and good paragraph to obtain data about my presentation subject, which i am going to deliver in college. read content, but this weblog gives feature based content. Hurrah, that’s what I was exploring for, what a information! present here at this website, thanks admin of this site. I go to see day-to-day some web pages and websites to read articles, however this webpage provides quality based posts. After going over a number of the blog posts on your blog, I seriously like your technique of blogging.